Watching Iron Man 2 again was a bit of an eye opening experience. When I originally watched these movies in the theater I had been so shocked at what had been done with the Incredible Hulk that I saw it as a slightly worse film then it really was. The fact that Iron Man 2 had so much of what I recognized from the first Iron Man and had all the performances that I'd adored from those movies made me feel that it was a slightly better film then it really was. On my review several things jumped out at me that I hadn't noticed before. One of the things that becomes painfully obvious when you watch this movie that it is almost completely carried on the back of Robert Downey Jr. 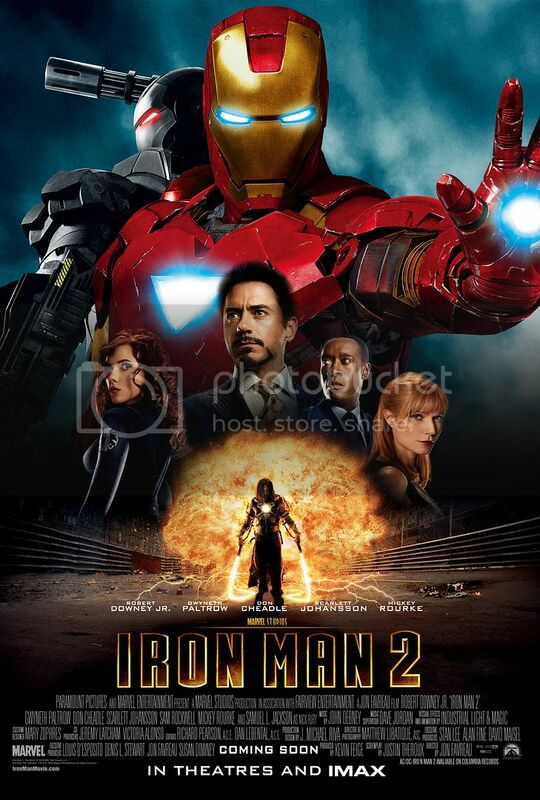 The first movie had Downey Jr and also Jeff Bridges and Gwyneth Paltrow was outstanding in that movie. This time we Downey Jr. Pepper is there but her part this time is to look constantly perplexed, angry, or bewildered in a fashion that doesn't really endear her to the viewer and isn't really any kind of stretch for her acting abilities. They cut the one scene that would have evoked that lovely frisson that she had with Tony in the first movie - the scene that was in all the trailers where she kisses the helmet and throws it out of the plane so that he has to fly out and catch it. Don Cheadle is fine, but as I've said before I don't think that he has the chemistry with Downey Jr that Terrence Howard had. What do we have for villains? We've got Sam Rockwell who plays Justin Hammer as if he's in a Dana Carvey Saturday Night Live sketch and Mickey Rourke as a one note Russian. Downey Jr does his best to try and save the thing, but the script works against him, since it means that for three-fourths of the movie Tony has to act like a colossal douche and alienate everyone around him. I realize that's classic Tony behavior, but at the same time it makes this movie feel strange because the guy that you learned to love last time now has to carry the story but is also not acting like that same lovable guy. I would be remiss though, if I didn't point out that this is the story that debuts Scarlet Johanson as the Black Widow. Her role isn't huge here, but as basically the "straight man" in the Iron Man comedy show she comes off with a colossal screen presence. The quiet works and the look that she gives Tony in the beginning when he calls her into the boxing ring and she just stares at him as if he's so far beneath her is marvelous. Also rounding out the supporting cast is Clark Gregg as Agent Coulson and his role is very much the same as in the previous movie although somewhat diminished. I'm guessing that he had conflicts with the sitcom that he was in at the time. Jon Favreau also recasts himself as Happy Hogan whose part is actually increased and he gives a solid performance as Tony's driver and right-hand man. Am I the only one who doesn't buy the relationship with Pepper and Tony in this movie? It's almost as if the studio said "hey, people like these two, so get them to kiss at the end." He's been a jerk through the whole movie. Even when he's supposedly realized that he needs her and needs to apologize his peace offering is something that she's allergic to, making it somewhat obvious that it isn't just a cute affectation that he pretends not to pay attention to her. He really doesn't pay attention to her. He ogles Black Widow throughout the whole movie but then because he saves her from some explosions they have the passionate kiss and apparently decide to become a couple?! If anything this would have been a good point to introduce a little difficulty so that we could have that kind of ending as the culmination of the Iron Man trilogy. As much as I loved Pepper and Tony in Iron Man they worked so well because of that dynamic of mutual attraction but unable to do anything about it. I also don't really like the idea of her working for him, because it just feels so false. Corporate America doesn't let you do things like that and it's just such a glaringly obvious problem that it bothers me. I know that they had her quit in this but the following movies show that never really stuck so we remain with the same problem. I also don't get why Pepper goes from hating Black Widow at the party to them being besties the next time they're together. It feels like we have a missing scene but it's not on the DVD. Also, why *is* Widow so mad at Tony in that scene in Pepper's office. It doesn't seem in keeping with trying to keep a cover as being a Stark employee, it doesn't work with her S.H.I.E.L.D. assignment of being there to keep an eye on Tony. Were they trying to imply that she was trying to seduce Tony earlier and was mad because he didn't go for it? I have no problem with her trying to seduce him as that would be an effective way for her to keep an eye on him and is in keeping with her origins as a character, but is she really supposed to be besotted with him? It just seems like something thrown in at random to create a funny scene. Hammer is the most ineffective villain ever. I get that he was conceived as kind of a joke, but he becomes tedious because of how dumb he is. He bails Ivan out, a man who was obviously willing to die to get his revenge. His original suit wasn't invented with defense in mind and if Iron Man hadn't come then he'd have likely been taken down by someone eventually shooting him from behind. We're supposed to believe that Hammer is so dumb that he'd bring in a man like that with no leverage and expect that he'd just do what he says? Really? Hammer worked as a villain because even though he's never going to be at Tony's level he's willing to do underhanded things to level the playing field. The greedy capitalist makes a fitting foil for the philanthropic Tony Stark. This buffoon isn't really worth his screentime. This is going to be me showing my engineering background, but I also have a real problem with a suit that can be overriden by remote control. Certainly functions like flight, which aren't part of the human movement I can see being controllable externally, but it's a horrible design that would allow things like arm, head, and leg movement to be controlled by another source. A suit is supposed to move with your body. A powered suit like Iron Man can even amplify your movements. But having a suit that isn't even controlled by your movements at all is first of all really a robot and secondly dangerous for the pilot as shown here. It also makes you ask the question of why not just make it a robot. I don't think that worked. What I think that these first two Marvel movies show is the yin and yang of Favreau's hands off directorial style. The first movie succeeded because Favreau let the actors decide a lot of the story. You see it in the DVD extras. The scenes evolved based on the input of the actors. Stane became the sole villain in the film because Bridges showed that he could shoulder it. They didn't need the Mandarin and Crimson Dynamo anymore and in my opinion helped to focus the film. But not every idea is a good idea and Iron Man 2 feels like the other end of that style. Sometimes when you're hands off and everyone wants to add their own little bit the whole actually becomes less than the sum of its parts. We have a movie that's made up of a lot of little moments but they don't necessarily work together. I also think that the movie suffered by being rushed into production only a couple of years after the first one. Usually these movies are made three years apart because that's what you need to get all the prep work done on the script and story. By truncating to two years by necessity you have to start planning the film before you have a finished script and it kind of goes downhill from there. I think they also suffered from having Tony reveal his identity to the world at the end of the previous movie. By necessity that means that every movie has to revolve around the fact now that people know that he's Iron Man and what he's capable of, so we're forced to almost no longer deal with him as a person but as Iron Man even when he's not in the armor and I think that closed off a lot of possibilities for them. Iron Man 3 would later turn that into a strength but I think that this movie was still foundering with the implications of that. I think that in a lot of ways they'd have been able to make a better movie more easily if they'd just gone with the classic story for Iron Man. We've got two plots. It's a real shame that they have absolutely nothing to do with each other. There's the Tony dying plot. That ends up going up a plot cul-de-sac that gives us an excuse to bring Fury and Coulson in and tries to justify Tony's bad behavior earlier in the movie but in the end, Tony just watches a movie from his dad and over some time and technobabble figures out how to save himself. It is always an issue with a story if both the problem and the solution come from technobabble. There's no human element in this storyline at all. It's an excuse for an infodump, so that we can tie into Captain America and give some cameos, but that's it. There's never a point when the fact that he's about to die really influences what's going on with Ivan trying to get his revenge. The best that we get is that Ivan tells Tony that he knows. Then there's the Ivan revenge plot. It's where the main story lies but it would have been nice if there had been more nuance to this. Maybe Ivan's father wasn't the bad guy that he was said to be. Maybe Ivan knows how to fix Tony's chest problem. Just about anything would have been better then basically putting in the death plot as padding. Another issue here is that it feels like they're throwing in everything including the kitchen sink. The first movie kept it simple. We had two villains but they didn't go far into explaining the Ten Rings and really it was Stane's movie. Here we've got shades of demon in a bottle and the armor wars. We've got shades of both Whiplash and Crimson Dynamo. We've also got this idea of Tony dying. The problem with throwing in so many things is that the movie can't do any one thing well. I'd have loved to get full on Demon in a Bottle but there was no time for that. I think that the Armor Wars should have been a basis for one of the Iron Man movies. Instead we get some weak talk about weapons proliferation and how Tony is confident that no one will be able to copy him but what happens in this movie. He allows (and yes it's confirmed that the only way Rhodey could have taken the suit is if Tony planned it) Rhodey to take the suit and thus the US government and Hammer Industries now have the design, which increases the odds that someone will steal it. They also say in this movie that the Iron Man technology is patented which throws the whole idea of the armor wars out the window. Patents only protect you from honest people. They're public records so any dishonest person could steal the technology. The idea of armor wars was that Tony never patented anything because he kept the plans for Iron Man as a secret only for him. Anyhow it feels like the movie is trying to many things and as a result isn't doing any of them well. Who really wanted another suit fight, especially when the one in the first movie was BETTER. Yeah we had drones this time for a long action sequence and that was fine, but the end of Tony and Rhodey vs Ivan was somewhat lame. They only defeated him because he kept opening his helmet. If he'd kept the thing on then the explosion probably wouldn't have killed him it doesn't make sense that he'd have opened it anyway. Directors say that they do that kind of stuff because you need to see the actor's face but we could have seen his face inside the helmet as they show us those kinds of shots of Tony and Rhodey all the time. It was just stupid really. I wish that they'd come up with a different type of villain here. I also wish that they'd come up with a way for Rhodey to leave the service and become War Machine as Tony invited him to do in the first movie because the end of this movie doesn't really solve the issue of armor proliferation and it hamstrings what they can do with Rhodey's character since if he left now he'd be forced to give up the suit as well. What I do like is how they worked this into the Marvel cinematic universe. The screen with the events of the Incredible Hulk on it was very clever and meant that this movie, Incredible Hulk, and Thor all happen simultaneously, which helps us to understand why these events are all considered amazing by those who view them. It's still early days for superheroes and the public hasn't had time to get used to the idea. The prototype Captain America S.H.I.E.L.D. was also nicely utilized, showing the lack of concern that Tony has for something so iconic, but also giving us a teaser. Then there's also the tie-in to Thor at the end, which actually included a scene from the movie, which was about as perfect as I think that they could have done it and made me so excited for seeing the next movie. At the end of the day, I think that lightning just happened to strike with Iron Man. The right people were involved and they were able to run with Favreau's directorial style to create something better than the sum of its parts. The problem is that Favreau defaults to comedy and several times on the DVD commentary he mentioned that "a laugh covers that". Whenever he didn't know what to do with the script or he felt something didn't work he made something silly happen as a form of misdirection. That kind of thing works in the moment and you might get a short laugh out of it but if the humor doesn't serve the story you still ultimately have a problem and I think that was the real failing of this movie and it's probably why he was removed as director for the third installment. Thankfully RDJ was there at least to at least help get us through this one with the hope of something better in Avengers and Iron Man 3. Just as a note for those interested. The DVD set again has more extras than the blu-ray although that isn't much. They have some deleted scenes, which is a little frustrating because Favreau mentions tons of deleted scenes in his commentary but we only get four or if you get the blu-ray you get none. There's also one featurette but none on the blu-ray. The blu-ray only has the director's commentary as an extra and an interactive file on the Iron Man armor. It seems like a waste of the storage space on a blu-ray. The DVD was hamstrung because the extras disk was also the digital copy so I think that it lacked storage space. Ho hum.